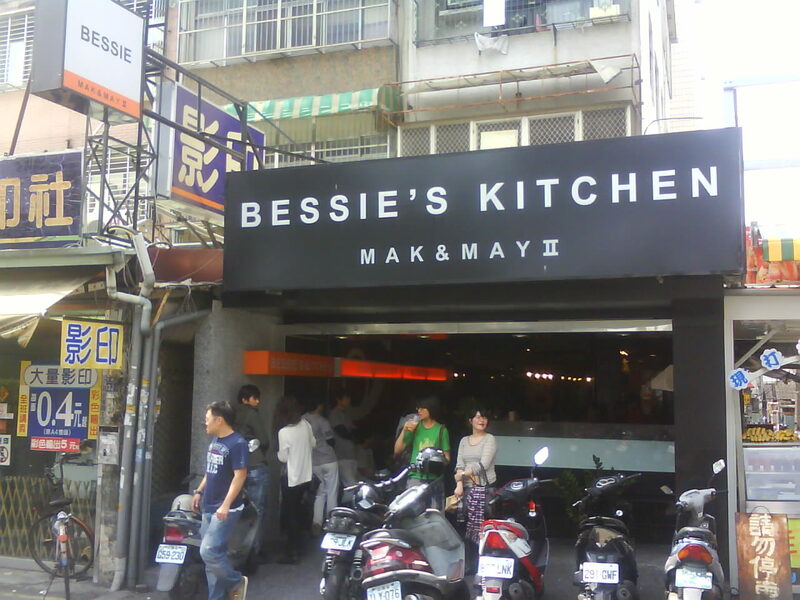 Bessie’s Kitchen MAK & MAY II is located just outside Feng Chia University’s Wenhua Road gate, so it is a really convenient place for lunch or dinner. More importantly, the food is good and the price is right - about NT$90 for a meal. Mak & May II is easy to find – just look for the simple black and white sign. After you go in, you will see that the decoration is simple, too. The chairs are a bit old, and the lighting is not too bright or too dark. While the decoration is simple, the atmosphere is not – it’s quite “busy.” The music is a bit loud and the conversations of the large lunch crowd are even louder. Because Mak & May is such a popular place, you might have to wait a few minutes before being seated. The darkly dressed waiters and waitresses are very busy, rushing about taking orders and delivering meals. They look young and passionate. When guests order meals, they serve them with a smile. Many set meals are listed on the menu. There are three kinds of meals: soft omelets, au gratin baked dishes, and exotic rice. With your set meal, you also get a glass of green tea or lemon black tea. Because I didn’t know which meal was most popular, I asked the waitress. She said that the roast chicken omelet with rice and curry chicken rice were the most popular. I ordered the roast chicken omelet with rice. I didn’t have to wait a long time to enjoy my lunch. The roast chicken tasted soft and juicy. The omelet covering the rice had a smooth texture. I felt the rice was a little hard, but the French fries were good and crisp. Also, a sauce that tasted like salad dressing was provided with my meal. Dipped in this sauce, the roast chicken and French fries tasted a little sweet and refreshing. Although the meal was delicious, I did not finish everything. My waitress politely boxed the leftovers for me to take home. I recommend Bessie’s Kitchen MAK & MAY II. They offer a variety of meals, they treat guests well, the food is tasty, and the prices are reasonable. Finally, it’s a good place to get together with friends or family.